All-new for the 2006, the Hyundai Sonata reaches a level of quality and sophistcation previously unknown from the Sonata. While the new model's fit and finish is on a par with most others in its class now, the Sonata also offers more space than the competition. In terms of performance, it equals or bests comparably featured cars. 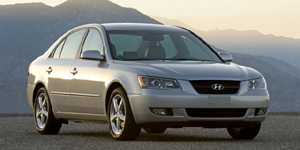 The 2006 Hyundai Sonata Sedan is powered by a base 2.4-liter Inline-4 with 162 hp. Also available is a 3.3-liter V6 with 235 hp.